Menus are not just for restaurants. In fact, I like using them as a source of inspiration to come up with dinner ideas that I can make at home. One of my favorite local restaurants serves amazing beef tenderloin tips and I decided to try making it at home. I hosted a special dinner with friends and it was nice to splurge with these Beef Tenderloin Tips with Bourbon Caramelized Onions. 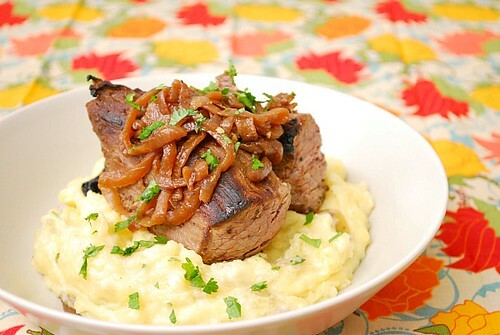 Tender beef tips are seared to perfection and topped with sweet and savory caramelized onions kissed with a touch of bourbon. Hunting down tenderloin tips wasn't as easy as I thought. It took more than just a simple visit to the grocery store. These beef cuts required some special ordering since they may not be carried at the butcher on a regular basis. Beef tenderloin is a pricey cut of beef and sometimes the tips of a whole tenderloin are removed. The tips are smaller, odd shaped and can often be overcooked when attached to the whole tenderloin. Once removed, they can be prepared on their own, at a more affordable price and still maintain the delicious qualities of the tenderloin cut. Once ordered from a butcher, they don't require any special preparation - let this good quality cut shine on its own. Simple seasoning and a good sear is all it needs to serve at medium rare or medium at the very most. This is definitely a very easy one pot Instant Pot dish that doesn't even require any pressure cooking at all. By using the SAUTE mode, you can see how versatile the Instant Pot really is for such an elegant dish, perfect for company. To serve with the beef tenderloin tips, all that's left is some caramelized onions that has a touch of bourbon and cream to flavor. Top the tips with these sweet and savory onions and you'll have a restaurant quality dish in the comfort of your own kitchen! Press SAUTE on the IP and add butter and olive oil; When barely smoking, add the Beef Tips and sear evenly on all sides. Once seared, remove the Tips from the pan and allow them to rest. To the same pan add minced garlic, minced shallot, and onions. Saute until onions break down and begin to caramelize, about 20 minutes. Deglaze with bourbon (beware of flame up). Add a pinch of dried thyme and heavy cream. Allow sauce to reduce over medium high heat until it thickens. Season with salt and pepper to taste. Serve over the tips. Garnish with fresh parsley.